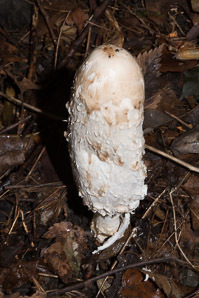 Shaggy manes are North American and European natives. 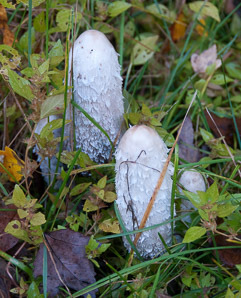 They are also common in Australia, New Zealand, and Iceland, but they were probably introduced to these locations. The ones shown here pop up in my lawn from time to time. 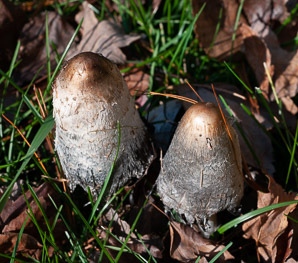 Identification: Caps are 1-2" (2.5-5 cm) around, egg-shaped or even cylindrical at first, spreading to become more disk-shaped and up to 3" (7.9 cm) wide. 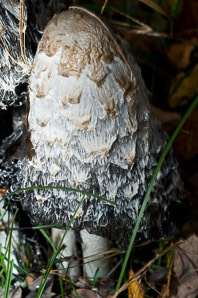 Younger caps have odd-looking hairy scales that I have not seen on other mushrooms, the reason for the common names “shaggy mane” and “lawyer’s wig.” Caps are mostly white, but some of the scales are brownish. 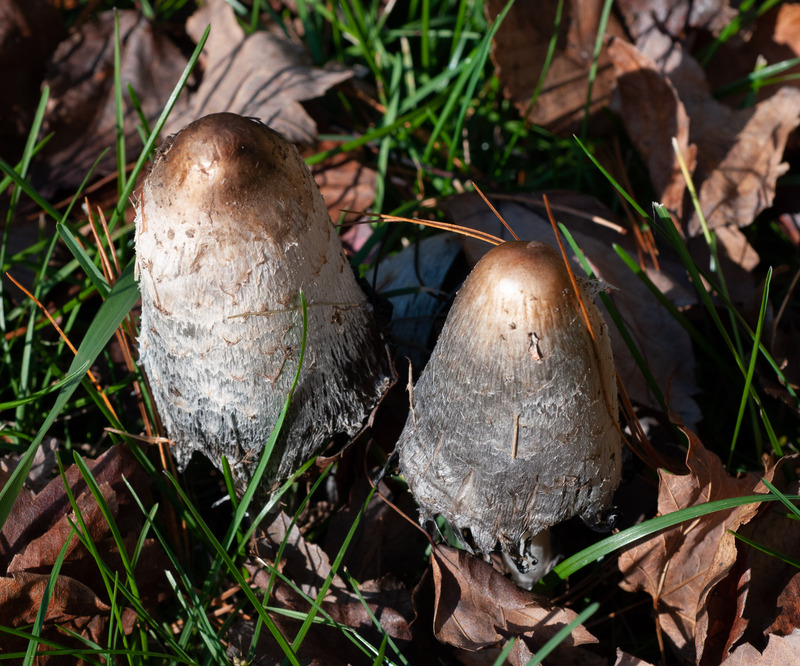 As the cap spreads out into a parasol, it becomes brownish. Eventually the mushroom self-destructs (technically, “deliquesces”)—dissolving itself into an inky black slime with enzymes. Stalks of these fragile mushrooms are 3-12" (7.6-30 cm) tall and up to 1" (2.5 cm) in diameter. 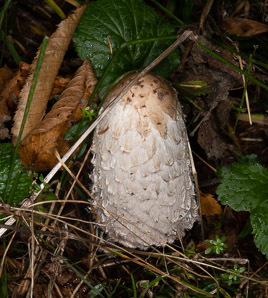 Gills are very closely spaced, white, becoming pinkish. 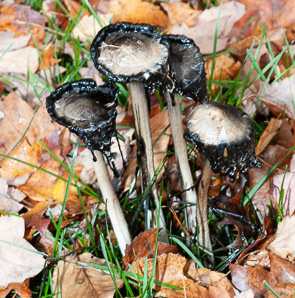 The spore print is black. Edibility: Shaggy manes are delicious, delicately flavored, well known among mushroom foragers, and hard to confuse with other mushrooms. 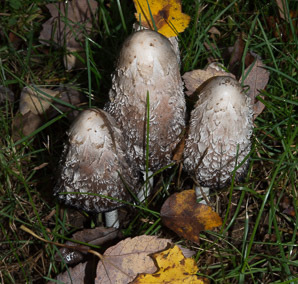 Young caps taste best, and may be halved and dipped in egg batter, coated with bread crumbs, and sautéed. 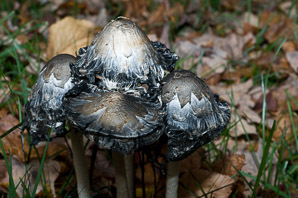 But these don’t keep because of their built-in self-destruct feature, so use them as soon as you pick them. 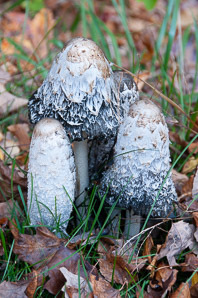 Some members of Coprinus cause gastric discomfort if consumed with alcohol. Reports vary about whether this is true for shaggy manes. Some accounts claim that consuming alcohol even a day or two later can effect you; others that there is no effect. 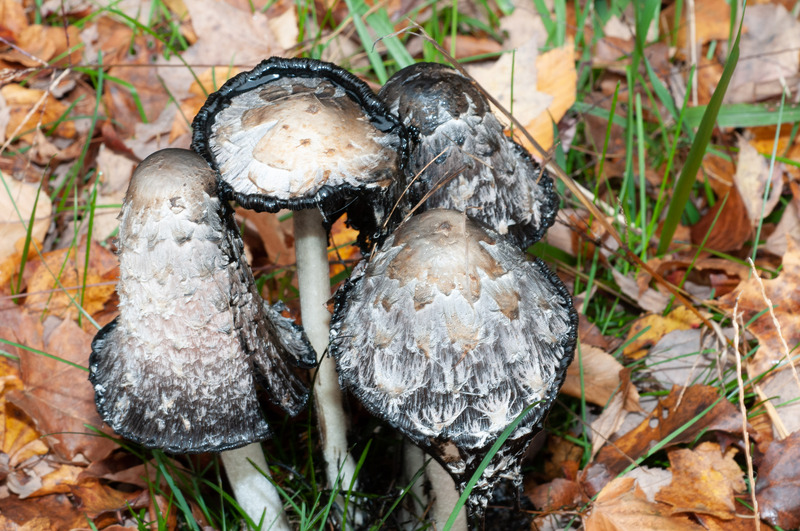 Sautéing in wine is apparently safe. 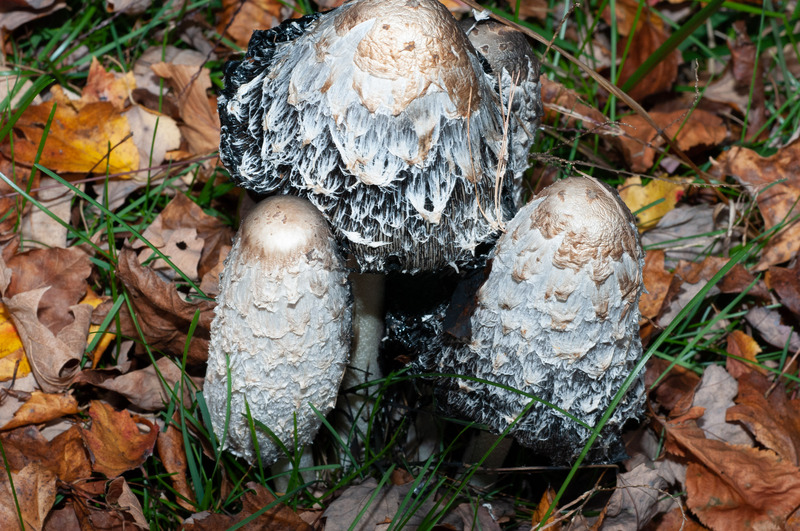 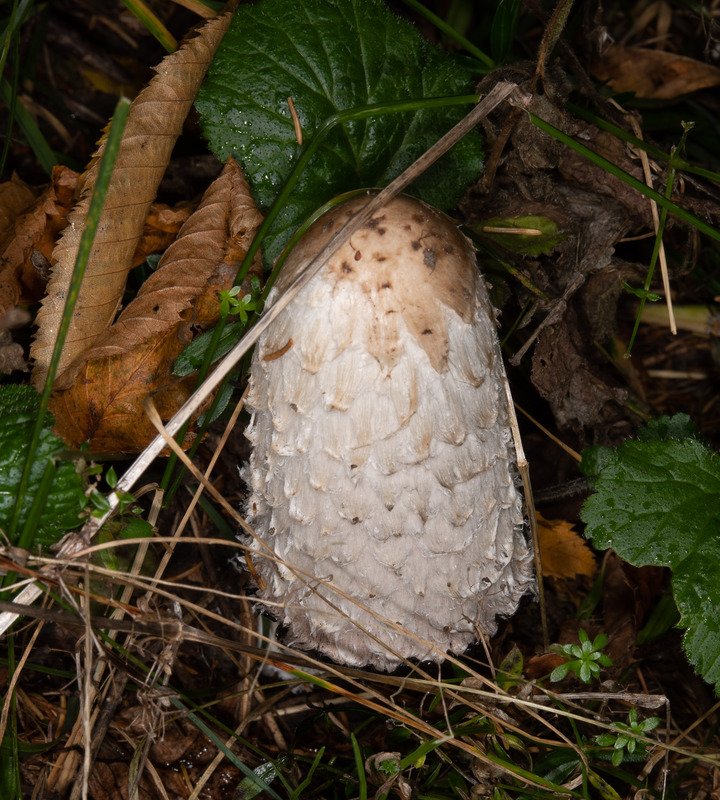 Coprinus comatus description by Thomas H. Kent, last updated 12 Oct 2018.